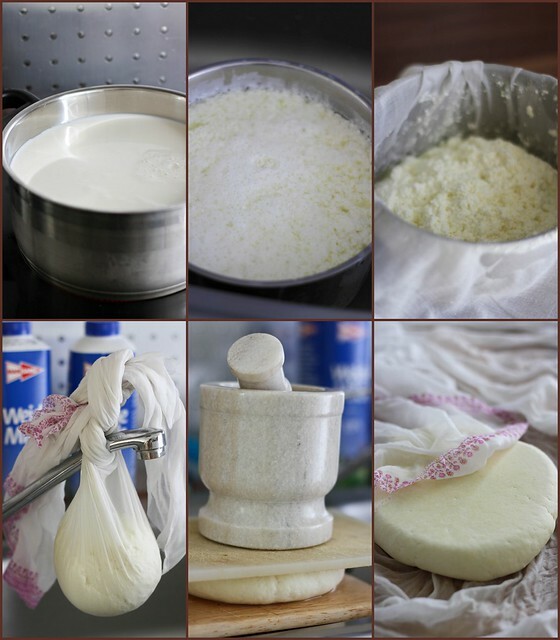 How to make Paneer at home! 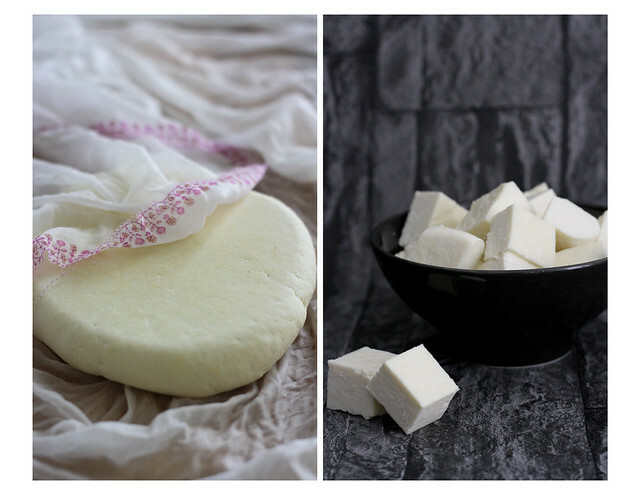 Nothing beats the fresh homemade paneer. It is very easy to make and tastes absolutely good. It is a very easy process, and once you get used to this, I bet you are never going to buy store bought one again! Bring milk to boil, in a heavy bottomed pan, stirring occasionally to ensure that it does not burn or form skin. When it just starts boiling, add 3 tbsp of fresh lime juice. The milk solids start curdling, and cheese separates from whey. 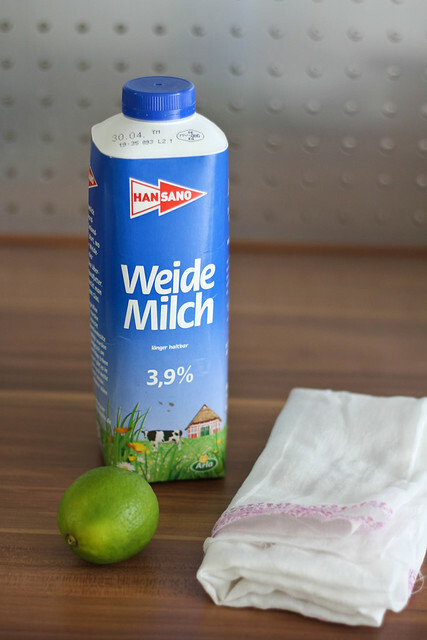 If the two are not split completely add two more tablespoons of lime juice. Strain the mixture through a cheese cloth/ muslin cloth. Wash the curdles, by running it through cold water to remove the lemon taste. 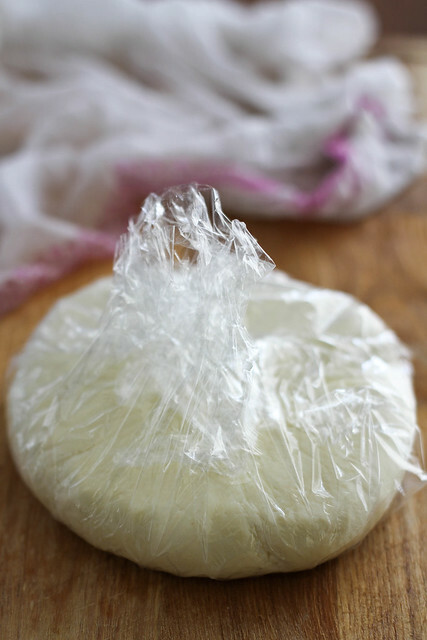 Tie up the cheesecloth in a tight bundle and let it drain for about 30 minutes. Place the cheese cloth bundle on a flat surface. Fold the cloth into a nice round shape, and place a heavy object like a clean brick or a big flat bottomed pan filled with water. This will press down the cheese. Leave it for a hour or two, and then store the block of cheese in refrigerator. This remains fresh for about 1 week. You can even use Vinegar instead of Lemon juice. It’s been a long time since I make paneer at home. It’s always so better than the store bought ones. im newly married….n by following ur recipies i m able to prepare yummy food.thanks alot! I am new to Indian cooking and a friend of mine sent me to your site. 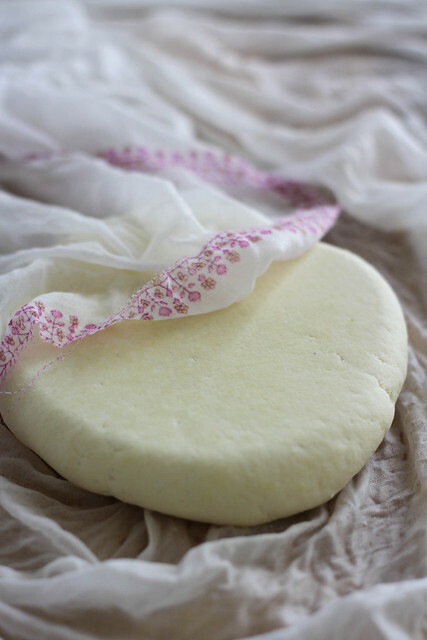 How easy it is to make your own fresh Paneer. Thank you for a great recipe. It depends on the number of hours you put the paneer under the weights. The longer the time, harder it gets. with the cloth. hold the paneer with the cloth under the tap.